Far off the beaten path yet easily spotted from the freeway, this Mazda 323 has been sitting in a field for several years. With the notable exception of the steering wheel, the five-door hatchback is complete but it has been the victim of petty vandalism and time has not been kind to it. Under the Mazda’s hood lies a 1.3-liter four-cylinder engine that sends 68 horsepower to the rear wheels via an automatic transmission. An autobox in an economy hatchback is a rare sight today, and it was even more so in the early 1980s. The license plate is not original and there is no dealer sticker anywhere on the car so we don’t know much about the its origins. When new, the 323 was aimed squarely at entry-level versions of the Renault 14 and the first-gen Volkswagen Golf. The press gave the 323 positive reviews but Mazda had a tremendous lack of both image and presence throughout most of Europe, a problem that still plagues it today to a lesser extent. Back in 1980, the average car shoppers didn’t know what a Mazda was and the few folks that did likely had no idea where to buy one outside of big cities, so the 323 was an underdog for most of its career. Ha, one can see it even on the areal view in Google Earth! It has been sitting there since at least 2002… And not far from the other find you had a couple of months ago (I think it was a larger Renault at the TGV viaduct). At first, I thought the mountain in the background was Mont Ventoux, but it isn’t. It’s the western end of the Montagne Sainte-Victoire ridge. The mountain range looks very interesting. Damn, you’re good with Google Earth! It’s very close to the Renault (now gone, bytheway), just across the railroad track and the freeway. It’s the Sainte Victoire in the background, Ventoux is further north, near Bedoin. 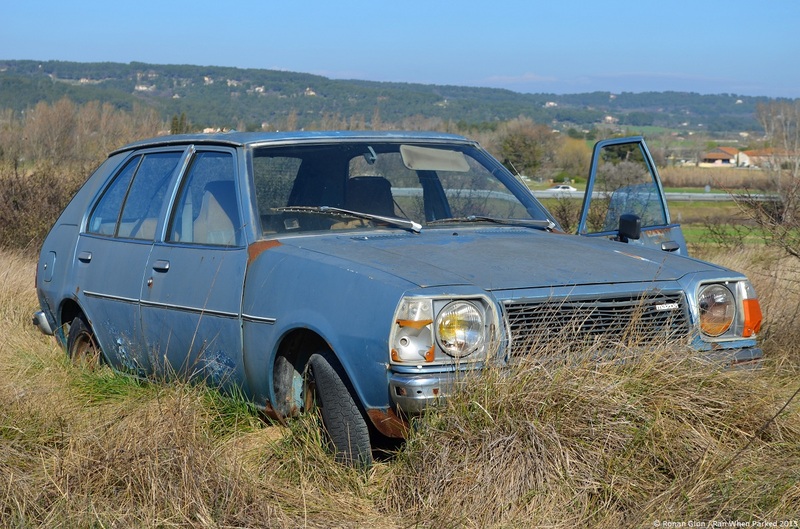 There used to be a run down car shop right near the bottom of the Ventoux with 6-7 abandoned cars including several Renault 8s, two Dyanes, etc, but last time I drove by it was demolished and the cars were gone, too bad. Eguilles is alright, it’s a small village that has grown far too much over the last few years in my opinion. I live a few villages over but I rarely go there, only when I go to the junkyard as it’s a nicer route. And the van, yep, that’s the one! I try to subtly include it (or whatever I’m driving at the time) in photos as a discreet watermark. This is interesting, bytheway: I took the photos when it’s sunny about a month ago, and the ones when the sky is cloudy earlier today. A month ago that wasp nest on the dashboard wasn’t there! The wasp nest is really beautiful. At first I thought it was some sort of decoration… 🙂 A simple and functional “design” by nature, yet for me pleasing to see. And including your car as a signature is nice idea! It wasn’t so much the Google Earth that made me think it’s been there a while, but the yellow headlight bulb! Weren’t those discontinued in France (EU regulations) about that time? It’s a shame these didn’t get the recognition they deserved. They were actually a fairly decent little car. We got them branded as a GLC, not 323. I haven’t seen any here in SoCal on the road or in a junkyard for a while, now. Regarding an auto box: pretty common here in the US, even at the time of the 323. Unusual for you guys. The yellow lightbulbs were discontinued in 1992, give or take a year. Some classic cars still have them – my van runs them – and you occasionally see the odd one-owner base-model 205 with them. GLC, that’s right, Great Little Car! Helluva a name. I don’t remember seeing any in Utah, either.